Yesterday I photographed this Buff-breasted Sandpiper on the NH coast, a very cool shorebird and an unusual bird for coastal NH. It was walking around the short grass in a parking lot, near some gulls and other shorebirds. This is a juvenile bird, told by the whitish margins of the back and wing feathers and paler underparts than the adult. An Arctic breeder, it usually migrates through the interior of the country and can be found during migration in plowed fields, upper beaches, margins of wetlands and short-grass habitats. Birds found outside the main migration route are often juveniles. Hope it has a safe migration. Major storms like Hurricane Irene present serious problems for migrating birds, such as shorebirds, some of whom are at the height of their migration now. Many of our shorebirds breed in the Arctic and fly tremendous distances out over the ocean and down to their wintering areas in South America. 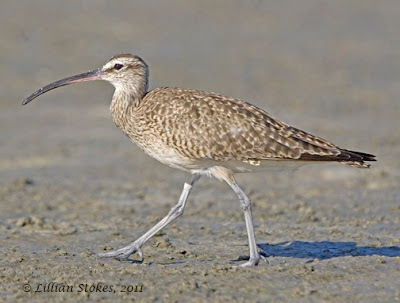 Evidently, at least one Whimbrel has made it through Hurricane Irene, according to Michael Wilson of the Center for Conservation Biology at the College of William and Mary, (as reported by Marshall Iliff on Mass Bird listserve, and also reported in USA Today. and appears to have encountered the outer bands of Irene on Tuesday. Updated tracking maps may be viewed online here. The Whimbrel was wearing a tracking device and is part of a long-term tracking study on how migratory birds navigate through and survive major storms. The scientific tracking project is a collaborative effort between the The Center for Conservation Biology, Georgia Department of Natural Resources, The Nature Conservancy, The U.S. Fish and Wildlife Service, the Virginia Coastal Zone Management Program, and Manomet Center for Conservation Sciences. This gives a whole new perspective on how difficult it is for many of these shorebirds and the challenges they face. They need protected breeding habitat and critical feeding habitat on migration, then must face challenges like hurricanes. 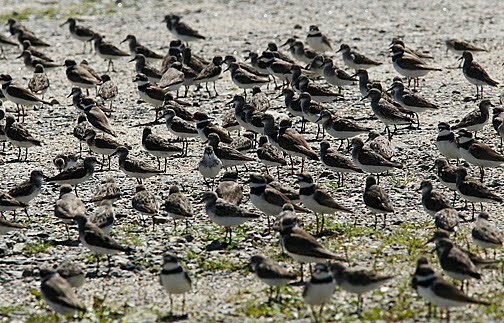 Fingers crossed for all the birds who are in the path of Hurricane Irene and stay safe yourselves! 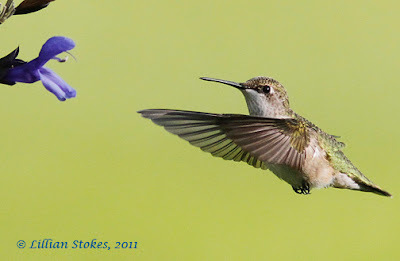 We still have hummingbirds at our hummingbird feeders and flowers. Here's a Ruby-throated Hummingbird visiting Salvia "Black and Blue" flowers. 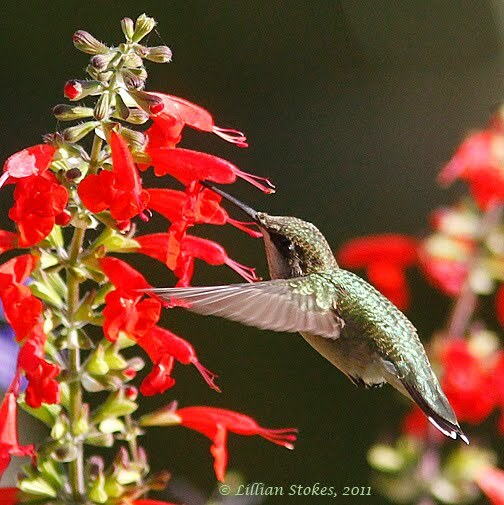 Hummingbirds are partial to red tubular flowers but they also like this salvia. 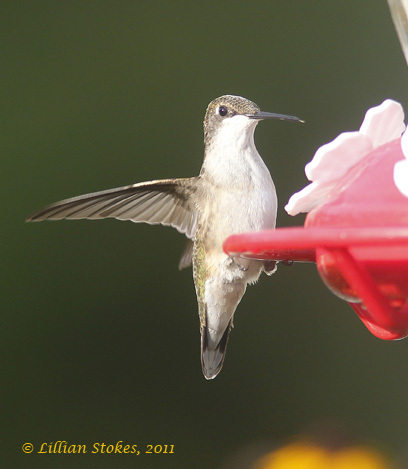 Plant lots of flowers and put up feeders to attract hummingbirds. Now is still a great time to put out hummingbird feeders, since many hummingbirds are migrating and may stop at your place. Hummingbirds have very good memories and if they find your feeders, chances are they will visit again next year. Hummingbirds are migrating big-time in August and into Sept. This Ruby-throated Hummingbird is visiting our Lady-in-Red Salvia. Both adult hummers and young ones are beginning to move and their populations are at peak. Keep your hummingbird feeders clean (clean every 2-3 days in hot weather so no black mold grows in feeders) and filled with fresh nectar and enjoy the hummingbird parade. 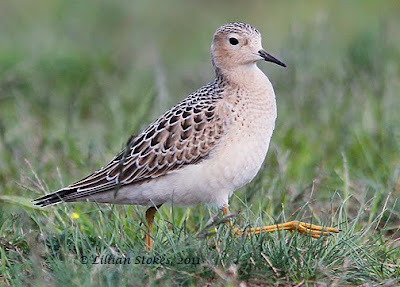 Shorebirds are migrating now, having completed their breeding in Arctic areas where most nest. 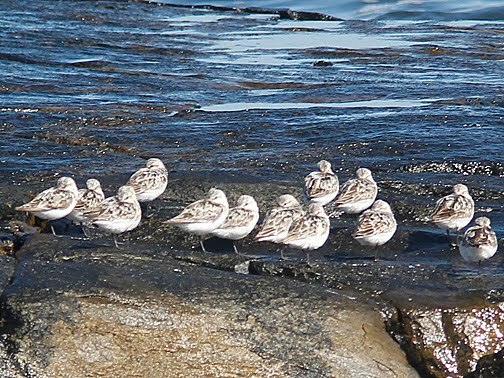 Here are resting Sanderlings. We birded the NH coast yesterday, braving the crowds of beach-goers. Found several hundred resting shorebirds, mainly Semi-palmated Sandpipers, Semi-palmated Plovers and a few White-rumped Sandpipers, in a parking lot, trying to get much needed rest. These little birds must travel very far to their wintering grounds south of the U.S. They need to stock up on food to fuel them, and get some rest also. There are so little places left for them, this parking lot by a fishing coop must do today. To learn to ID shorebirds, do it by shape and size. If you are a beginner or intermediate get our Stokes Beginner's Guide to Shorebirds, sooo easy. For the full nine yards and THE most complete reference, get our best-selling The Stokes Field Guide to the Birds of North America. 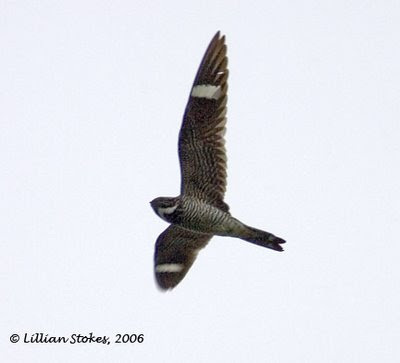 The last week in August is peak Common Nighthawk migration. Look up into the skies at the end of the day, 5-8 pm when they move. They are awesome birds! Just can't get enough of Indigo Buntings! 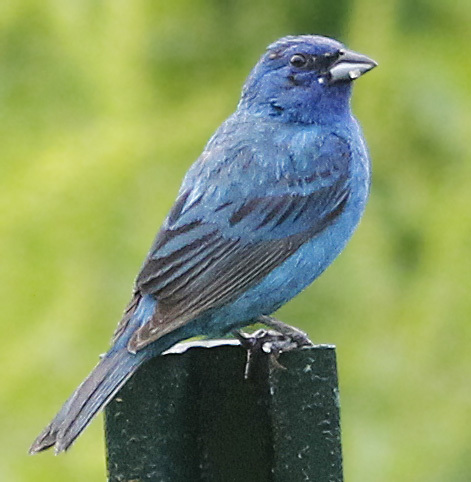 Lucky us, this one showed up at our bird feeders this morning. Dew drops on its bill. Buntings like bird seed mixes with millet. Keep an eye out for buntings and other birds which are moving around now that breeding is mainly done.